Located at 111 Bathurst Street Toronto, the new oneeleven Condos is a signature landmark building of 17 storeys brought to you by Brad J. Lamb Realty. Designed by CORE Architects, the new Toronto oneleven Bathurst Condos is all about high-design and iconic architecture featuring a total of 255 units that start from 655 square feet and offering over forty different unique layouts for condominium buyers to choose from. The oneeleven Toronto condos for sale will feature functional use of space, open style layouts and some featured two level loft style residences. Amazing landmark architecture by CORE Architects coupled with II by IV Design Associates interior design will make this a prominent development. The oneeleven Toronto condos for sale are developed by Carttera Private Equities and Harhay Developments and again, are located at 111 Bathurst Street Toronto. 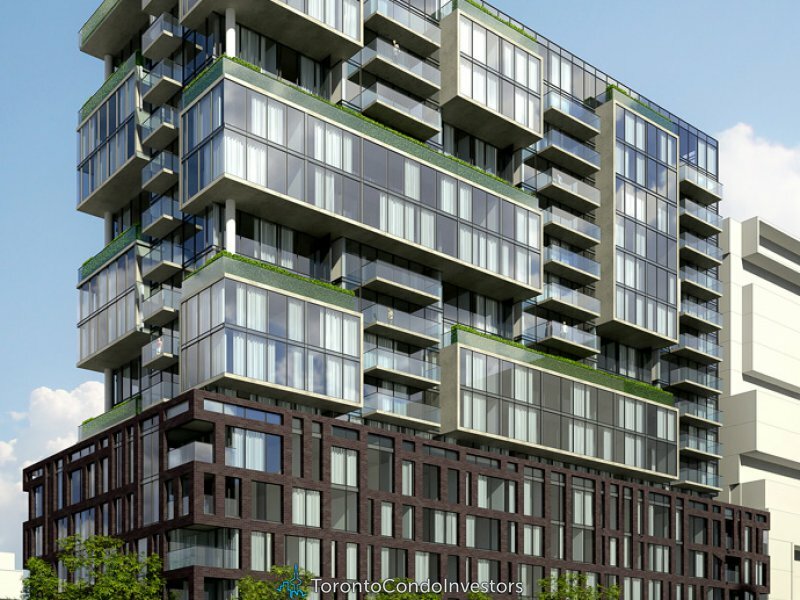 The grand opening for the presales at Toronto oneeleven condos is scheduled for April 28th, 2012 starting at 12 noon. The floor plans will range between 655 square feet to 1934 square feet and the ceiling heights are between 8 to 11 feet tall. 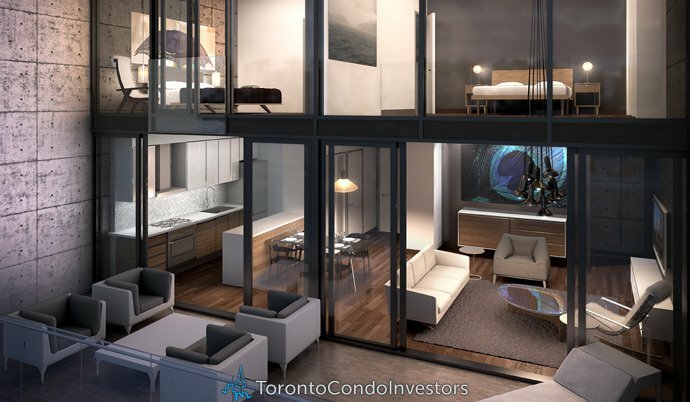 Some of the luxury Toronto oneeleven penthouse suites have over fifteen hundred square feet in entertainment sized outdoor terrace space too! 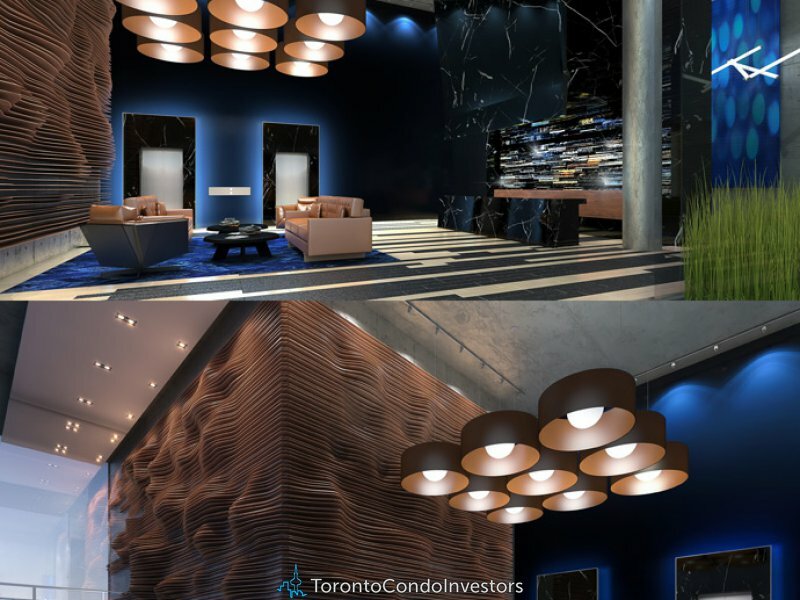 The distinctive interiors at oneeleven Toronto condos includes Blue Tiger’s Eye gemstone walls as well as a high contrast palette that includes extensive use of blacks, oaks, ambers, navy tones and much more. The striking black marble vertical beams in the entrance lobby will be the featured first impression as residents and guests enter the new Toronto oneleven condo building. The floor to ceiling glass windows that have low-E glass in addition to light filled interiors are other incredibly designed features at the luxury Toronto oneeleven Bathurst condo project. For more information and to register online for the oneleven Toronto condo project marketed by Brad J. Lamb Realty. Designed by II by IV Interior Design firm, the oneeleven Toronto condo interiors are high-end, beautiful and crisp. From hardwood flooring to exposed concrete ceilings and from signature two level oneeleven loft residences to the spectacular Toronto oneeleven penthouse units, this is the most promising and exciting new Toronto real estate development in 2012! The interiors will feature ceiling heights between 8 to 11 feet in addition to expansive, double pan thermally broken windows that run from floor to ceiling, as well as exposed concrete ceilings in all areas except for the laundry closet and bathrooms. Other interior features include white painted interior walls, baseboards, slab style bedroom, bathroom and closet doors with modern hardware. 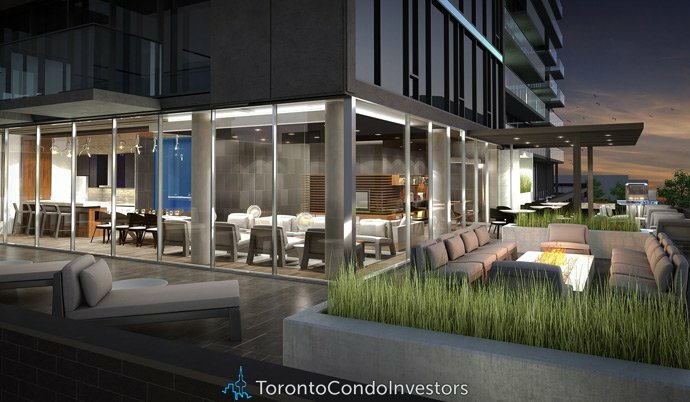 All homes at the boutique Toronto oneeleven condos for sale will come with individually controlled heating and air conditioning in addition to gas BBQ connection and hose bibs for the outdoor balconies/terrace decks. The new oneleven Toronto condos for sale will also have featured kitchens with island as per plan, Euro style slim line cabinetry, beautiful backsplashes, stone counters, single or double bowl sinks (under mount and stainless steel), in addition to an amazing array of stainless steel appliances. The floor coverings at the oneeleven Toronto boutique condos for sale at 111 Bathurst Street include porcelain tiled flooring in the bathrooms as well as pre finished engineered wood floors in all other areas including the bedrooms. The bathrooms at the boutique Toronto oneeleven condos for sale will have custom designed European style cabinetry, basin integrated into solid surface counters, pressure balanced mixing valve, deep soaker bath tub, white bathroom fixtures and ceramic tiled walls and surrounds. There is a rain style shower head as well as full width mirror in the main bathroom as well. The boutique Toronto oneeleven condos for sale will also have an electronic communication system with the main entry and the new home warranty.